Hightstown, NJ —– Erv Miller thinks Artie’s Ideal has his best days ahead of him. Miller hopes that includes Thursday when the colt visits Dover Downs for the $213,000 Matron Stakes for 2-year-old male pacers. Artie’s Ideal was a two-time winner on the New York Sire Stakes circuit and finished third in the series championship before trying the Grand Circuit for the first time at Lexington’s Red Mile. 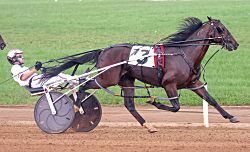 The colt was second to Workin Ona Mystery in a division of the Bluegrass Stakes, pacing a :26.1 final quarter-mile, before a seventh-place finish in a division of the International Stallion Stakes. 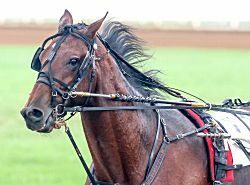 After a three-week respite, Artie’s Ideal qualified in 1:54.2 at Harrah’s Philadelphia on Oct. 30 to prep for the Matron. He won the qualifier by 10-1/2 lengths. Artie’s Ideal has earned $114,508 in nine starts. USTA/Mark Hall photo. “He was a real green colt getting started and he’s just been getting better all the way through,” said Miller, who trains Artie’s Ideal for owner Bay Pond Racing Stable. “He had a little setback the second week at Lexington, his blood was a little messed up, but as far as getting more mature he’s gotten better every time we went to the gate. Artie’s Ideal and driver Marcus Miller, Erv’s son, will start the Matron from post four. He is 10-1 on the morning line. Metro Pace runner-up Semi Tough, with Matt Kakaley driving for trainer Ron Burke, is the 5-2 favorite. “He got the four hole, that’s a good spot, and if things work out for him he should be right there,” Miller said. Dover Downs host the four Matrons for 2-year-old trotters and pacers Thursday. Racing begins at 4:15 p.m. (EST) with a non-betting race, the Matron for colt and gelding trotters, followed by the regular card at 4:30 p.m. Breeders Crown runner-up When Dovescry is the 5-2 morning-line favorite in the $177,800 filly trot and Breeders Crown finalist Queen Of The Pride is 5-2 in the $179,100 filly pace. Artie’s Ideal is a son of American Ideal out of Midnight Art. USTA/Mark Hall photo. Artie’s Ideal is a son of American Ideal out of Midnight Art. The colt has earned $114,508 in nine starts and is Midnight Art’s third six-figure-earner. The family also includes Grand Circuit winners Good News Lady and Ideal News. Miller said the colt was immature physically to begin the season, but has developed nicely. Artie’s Ideal is eligible to the Governor’s Cup later this month at the Meadowlands, but the Matron could be his final start of the year. “We’ll go off how he races,” Miller said. For Thursday’s complete pari-mutuel entries at Dover Downs, click here.